Andrew is growing up too quickly! Oh my, what a handsome little boy. Do I see some dimples? I am happy for you that you are visiting with your Daughter and Andrew. That little boy looks so happy and that hair!!! 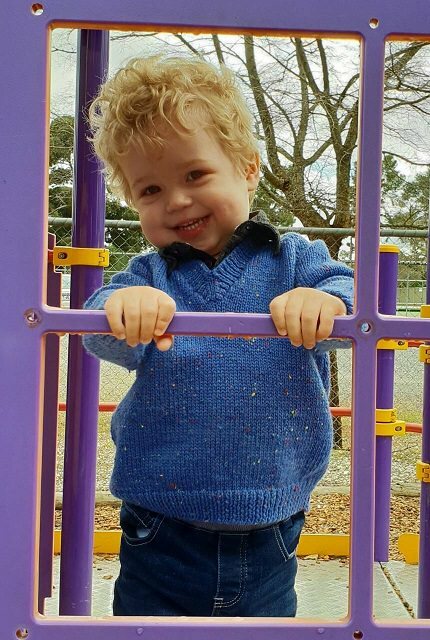 You have two grandchildren that are so beautiful and endearing Is that sweater one you made? livetobake... we are not with them, my daughter emailed the picture to me. We made two departure dates to go and visit but I wasn't well enough for either arrangement and I'm still not. Yes, that is one of the jumpers I knitted for him. I bought some very pale grey merino wool to knit him another for next year. The cold weather is almost over for this year. I love his curly hair but it's about to be cut short again. When he's at childcare he gets a lot of stuff stuck in his hair... playdough, sand, lunch, etc. and he hates having his hair washed so his Mum needs to make the process easier to wash.
Smokey... he is a lot of fun and his parents are loving every minute of him. I can't wait to see him again. I've been very blessed with my grandchildren. They are both as precious as each other. I am sorry you have not made the trip. I know how much you love going and visiting. Hopefully you will make the trip soon and have a wonderful time. I thought that was a jumper that you had made. I love yarn when it has little flecks of color in it like that. I just used some brown recently that had flecks of color and made a scarf for winter out of it. It really came out pretty. I hope you can go soon my friend. awww, makes my heart smile! I just want to grab him up! Bet he is a great giggler! !